pHur™ Will Help You Live Clean With Only Two Ingredients – Water and Salt! Let pHur™ redefine the way you disinfect your entire home. And the best thing about this brand – they have TWO ingredients! That is all! Salt and water! Ok really, how amazing is that? While you can stop competing with your all natural lifestyle and complete it. Simply apply pHur Cleaning Water to the Greenspeed™ microfiber cloth. Or to your mop pad. And then you simply agitate to clean! Because you can now clean anything in your home. From the toilet, kitchen, bathroom or even your babies toys. Or if your surfaces are already wiped down. Simply spray with pHur Disinfecting Water. And then you can just walk away and let it do it’s job. Did I say with NO rinsing, wiping or waiting? I really like the Disinfecting Water, because I can go behind my husband when he helps me clean the kitchen. And I can make sure everything is disinfected without hurting his feelings. Feel safe in the knowledge that you can achieve disinfecting your entire home. 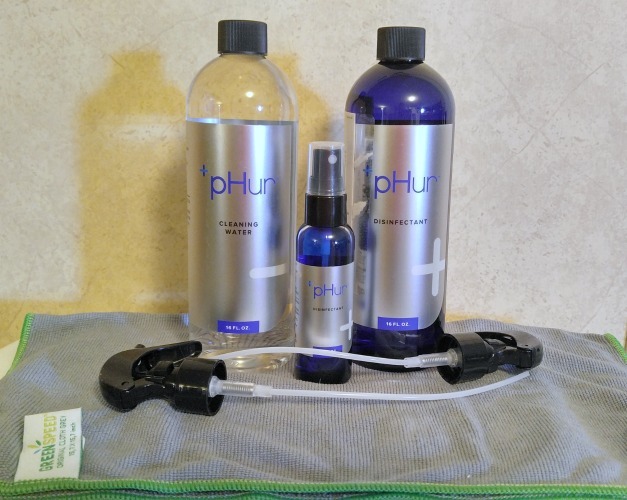 With pHur disinfection is totally redefined! Now you can live naturally, live clean and live pHur! Because if you want to tidy up daily, keep your kids bathed, wash your hands often and avoid touching door handles. Or if you wipe your counters down repeatedly. Do you buy organic, use essential oil remedies? Or do you grow a garden and have your own compost pile? Well if you do, you have the same pHilosophy as pHur! But now you can disinfect with pHur that will kill odor causing bacteria instead of just covering it up. Using no toxic chemicals or artificial fragrances. Just TWO ingredients! Salt and Water ! Leave us some comments of how you keep your house clean and sanitized? Do you like pHur as much as my family does? Connect More With pHur™ Water on their Website, Youtube, Pinterest, Instagram, Facebook, and Twitter.